Diamante del mio nuovo libro ed ineguagliabile valore aggiunto è questo esclusivo capitolo, appositamente ed esclusivamente scritto per me dal mio caro amico e mentore W. F. Bill Peterson (Willynwood Knl.). Questo scritto renderà inconfutabilmente chiare a tutti le origini e il percorso della nostra razza sin dai suoi albori nella “The Grand Old Breed”. Ogni passaggio del lungo percorso dell’ “All-American Dog” è dettagliatamente documentato da Mr. Peterson non a caso nato nel 1936, lo stesso anno in cui la razza ebbe il suo riconoscimento ufficiale dall'A.K.C. BIS: Firstly can You give us some background on yourself? How old were you and how did it all come about? I feel compelled to write to President Trump also to solve the growing problem in the rings of dog show in America and all over the the world... In fact, as few of us know, type and balance are of great importance and size should be kept in line with the Standard, and "showmanship is of some importance", but the real test for Am Staf is - the proper Terrier movement. German Shep is another breed. The ancients said: "Like begets like"... was one of the oldest forms of selective breeding that created most of the dog breeds. The method was essential, it consisted in establishing the kind of dog that the breeder had decided to represent as his "ideal type" in few generations, mating it with others of similar type, eliminating all that closely don't resemble its parents. This technique is still one of the most important basic principles of the selection. To speak about the Am Staf selection it is of fundamental importance that I tell you something about the beginnings of Cliff Ormsby's breeding. In almost no other dog breed, recognized by the American Kennel Club and the F.C.I., is possible to establish the origins and the path of the ancestors with certainty and precision, except for the American Staffordshire Terrier. This “All-American Dog” breed was handed down to us by the U.S. 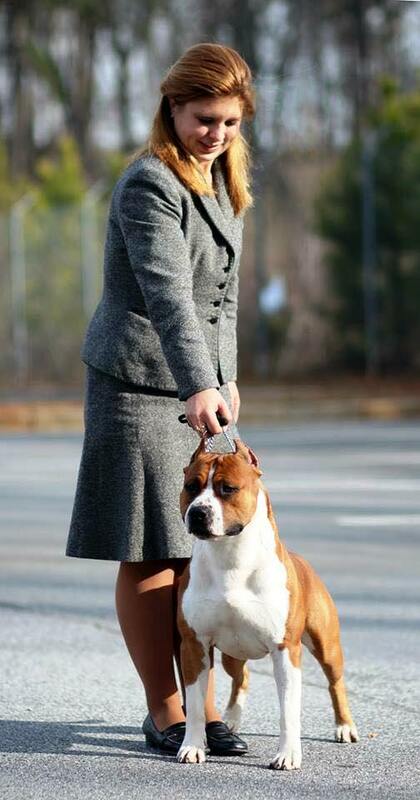 Breeders; these dogs have an intact temperament, they are physically healthy and reliable towards human beings. The Am Staf is ideal as a family dog, excellent for work; it is an affectionate and happy dog. It likes living with the family and for the family. WHY AND WHEN DID YOU START TO KEEP AND BREED AM STAF? The precise motivation for which I have decided to breed this Dog was the consequence of the study of more then ten years and the attendance which I had from the late 80s in the USA. Attending the exhibition of AKC and in particular seeing some Am Stafs presented by John McCartney at that time, it was born and created, inside myself, something important and ambitious which bought me, after 10 years, to breed my first litter alone. Only after having evaluated my breeding program, guided by the mentors like my dear friend John. A CYNOPHILIST CLASSIC. IN 20 YEARS MORE THAN 30,000 COPIES SOLD. FROM MARCH 2016 IT WILL BE AVAILABLE AGAIN IN ITALIAN. “ULTIMATE”: the Am Staf breed with its 4123 registered puppies to the ENCI only in 2014 has perhaps reached its historical peak. ancestors with certainty and precision, except for the American Staffordshire Terrier. CARDS ON THE TABLE! Happy 2016 to all the Families with an Am Staf De Paco. 2015 was an unforgettable year for Am Stafs’ De Paco, rich in success worldwide. Buddy, Dicky and Maddy got the title of AKC Champion and Rhino of FCI World Champion Best Puppy. Thank you for being part of the De Paco family and for your ongoing support year after year. We look forward to continuing celebrating De Paco Am Stafs and their owners with you in the New - 2016 - Year and beyond. Read more about CARDS ON THE TABLE! Happy 2016 to all the Families with an Am Staf De Paco. CH De Paco XZ Sindelar Buddy O' Dickies, aka "Buddy". In photo with his Brava american Handler, Blair Aguillard.